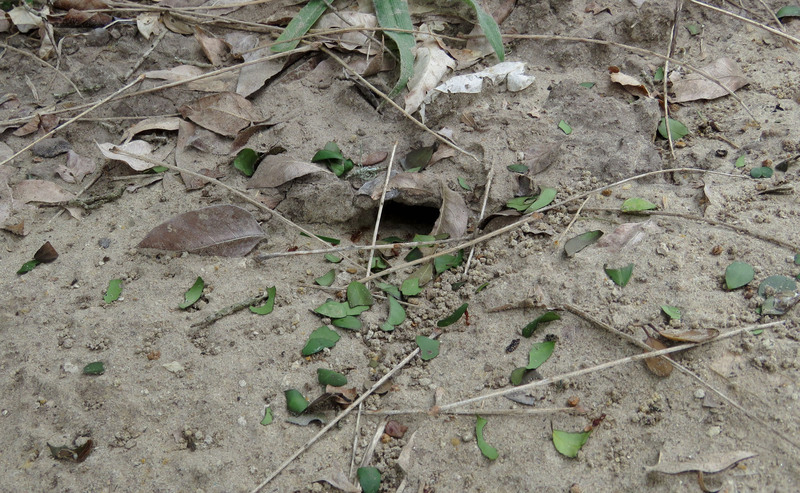 Before we went to Lake Somerville State Park over the weekend, I actually did a little pre-trip research, and saw a Texas Parks and Wildlife Department tweet that Texas Leafcutter ants had built up a big area with their nests. 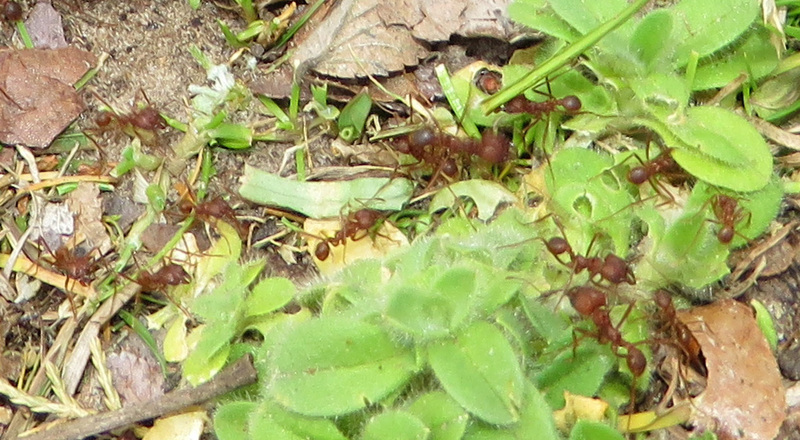 We were in a different part of the park than that mentioned in the tweet, but we saw the Leafcutter ants at work too. I probably would not have noticed them otherwise, but after seeing the tweet I was on the look-out for them. 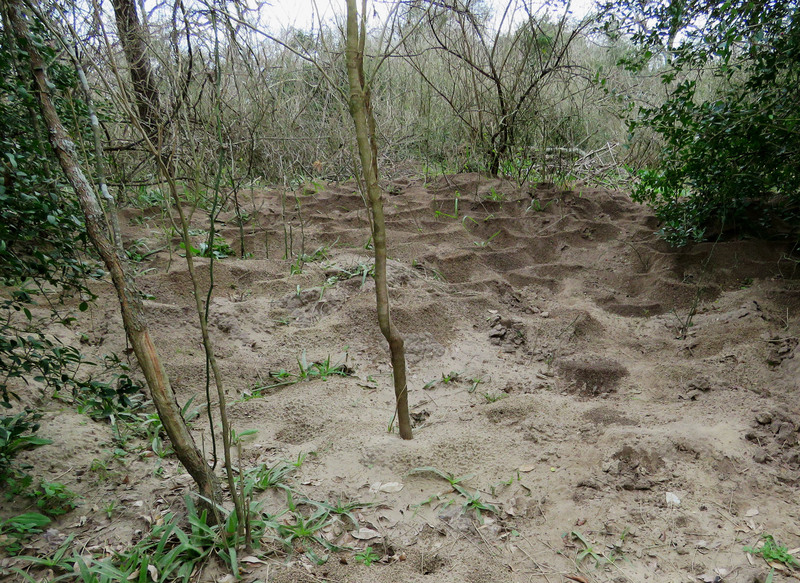 Large area of Leafcutter ant mounds. 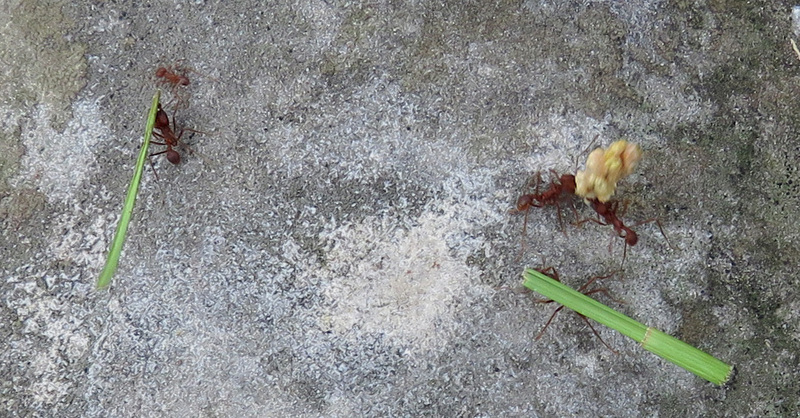 Texas Leafcutter ants (Atta texana). I think the bulbous yellow plant material is a dried goatweed seed head. One ant with a grass blade. 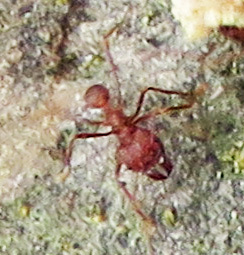 A temporarily leafless ant. You can see the huge mandibles. Entrance to the nest mound. A closer look at dozens of yaupon leaf fragments. Will these eventually be carried in to the nest? Or are they rejects? Close-up to show the ants better. A small group on their industrious way. According to the book Insects of the Texas Lost Pines*, these ants occur in just a narrow band across Texas from the Big Bend to Louisiana. They bring the cut leaves underground and then live off the fungus that grows on them. They prefer to use yaupon and farkleberry leaves and fruits, and also the small cones of Eastern red cedar, and they may bring the leaf bits 100 feet from the leaf source to the ant mound. Stems and leaves may be rejected and left at the entrance to the mound. We saw them with yaupon leaves but also with grass blades, and they were definitely traveling a long way with those leaves. We wondered why they didn’t just harvest leaves closer to their mounds. We watched for a while, but we couldn’t tell if each ant carries its harvested leaf into the mound itself, or whether some specialized worker ants relieve the carrier ants of their burden and transport it into the mound, and if so, if that would account for the rejected leaves scattered around. Yaupon leaves are small, thick, and dry, a lot like privet leaves. They don’t seem to me to be an ideal host for fungus, so I would be interested to find out more about that. And of course, there is more information on BugGuide. They can be damaging to young pine seedlings, but I have never seen them here on our farm. We could have watched them longer but we had to get down the trail and back to the car to make it to the cotton gin tour we had planned. *by Stephen Welton Taber and Scott B. Fleenor, 2003, Texas A & M University Press. We don’t live in the Lost Pines area ourselves, we live in the actual Pineywoods, but I bought this book thinking it would surely give me the specialized information I am always looking for, and it has been very helpful. Lake Somerville, where we were, is not in the Lost Pines area either, but it is pretty close. I love how you so rawly have captured nature with your words and photography. I am so happy to be following your blog. Such a unique perspective on our environment!! 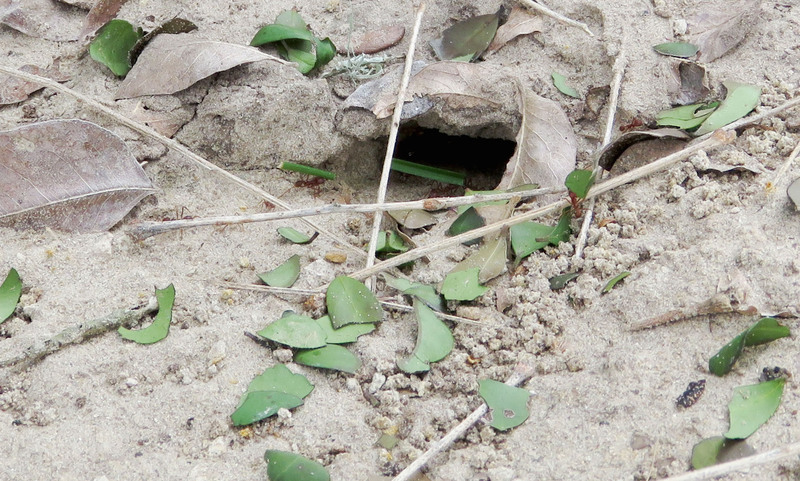 I found some leaf cutter ants in the gas easement! They were working hard on the yaupon leaves we had cleared from the homesite. I will check to see if they are still around so you can see them. I followed them for about 50 ft but never found their mound. It went too far into the brush. I have seen them in Conroe but not here! I will have to come over and take a look. Absolutely! We haven’t cleared any more underbrush over there in a while so they might not be as easy to find. I will text you if I see them. Fascinating pics and info (as ever). It is extraordinary that ants can carry such huge pieces, isn’t it? I wonder how the weight compares to their own body weight. And how intriguing too that they are so picky about the sort of leaves and stalks they will take in – I guess they have worked out which plants the fungus grows best on – just amazing little creatures!